After seeing and reading the performance gains from headers and a tune, I had to do it! I started searching the classifieds for headers, and found a set of used AP Racing Headers. At the point of the header purchase, I was undecided on which tune I was going to purchase. I was between the "self-tune" option, and evolve. I was leaning towards self-tune originially, as it was much more affordable option. After a couple months of going back and forth, I found another option my roommate told me about. My roommate was getting a tune from Jordan of RK-Tuning. I gave him a call, told him what I wanted and how much I was looking to spend. He was very professional on the phone. You could tell he knew what he was talking about. I checked out his testimonials and all of them were raving about his tune/service. I talked to Jordan about the tune, and he offered me the option for dyno tuning at ICS Performance. We planned for April 6th. We met at dubs on defrost and then left from there. 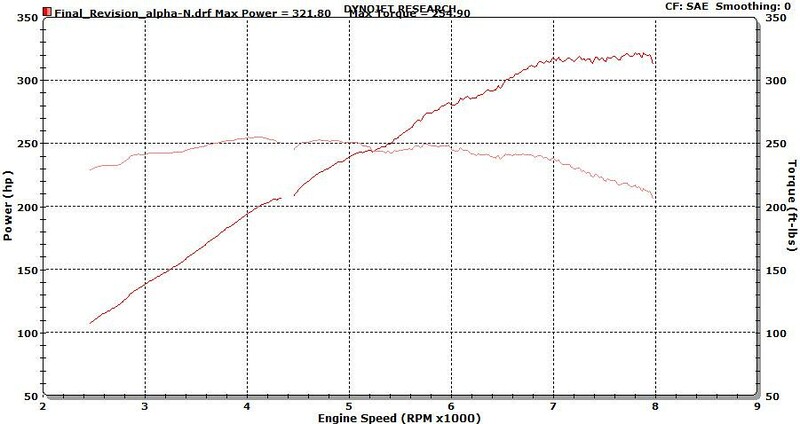 Jordan ran the car with his base tune, and the results were 301 whp, 251 wtq SAE. He made different corrections throughout the session to see what else he could get out the car. 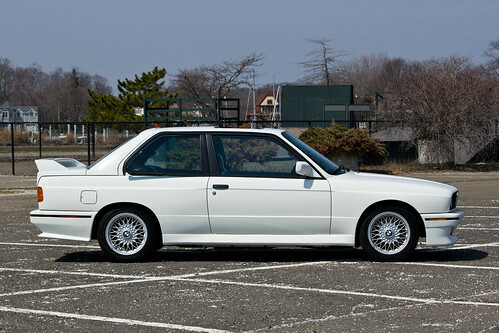 He ended up with 321 whp and 254 wtq SAE. To say the least, I am ecstatic with the results. Jordan spent a good portion of his night with my car and was absolutely dedicated to the car the whole time. Driving the car home was an absolute blast. Power delivery in every gear was smooth. The car pulled hard all the way to 8k. Linear throttle response - Great, really enhances the drivability of the car. Much easier to heel/toe. Headers - Love the Rasp!! Just need an axle back to compliment the car. Unfortunately, I do not have a stock base dyno. The dynos below show the base tune and the final tune my car is currently running. I can upload the AFR graph, as well. 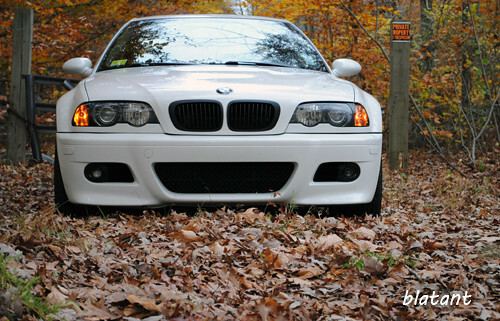 If you have any questions regarding the tune or a mod, let me know. I'll be happy to answer any questions. I will be sure to update this thread when I have put more miles on the car. Last edited by blatant; Tue, Apr-09-2013 at 12:19:18 PM. Wow, that is some impressive gains! How difficult is 93 octane to acquire in your state? I wonder how much of that power is gained because you had 93 octane tune. 93 is readily available in my state/surrounding states. Never have had an issue finding 93. Interesting, PM'd for more info. We can only get 94 at very selected gas stations in Ontario. So when I look for a tune, I can only ask for 91 at best. Either way, your car is making some very impressive power! 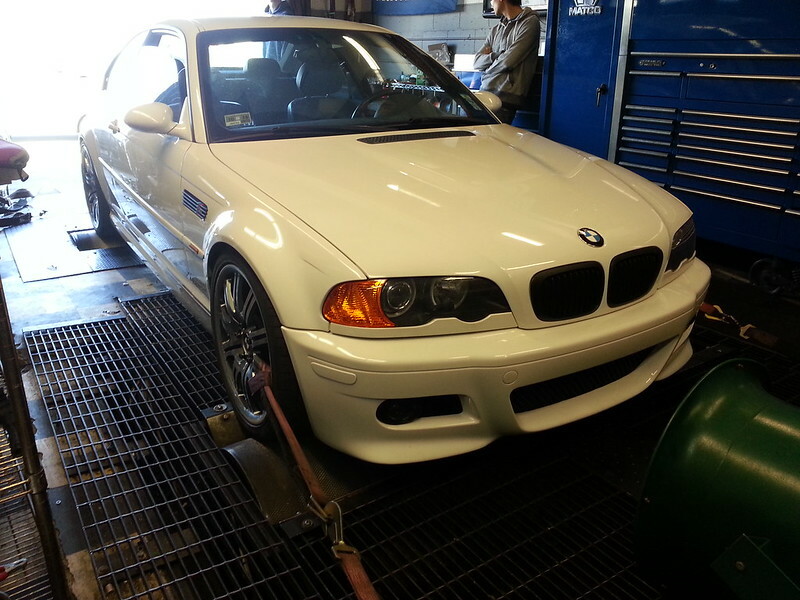 There is so much value in a custom dyno-based tune. I'd definitely spend the money over a canned tune. I'll respond to PMs soon! I appreciate it! I am very happy with the tune and power output. I'm sure Jordan could you hook you up with a 91 octane tune. Great numbers. 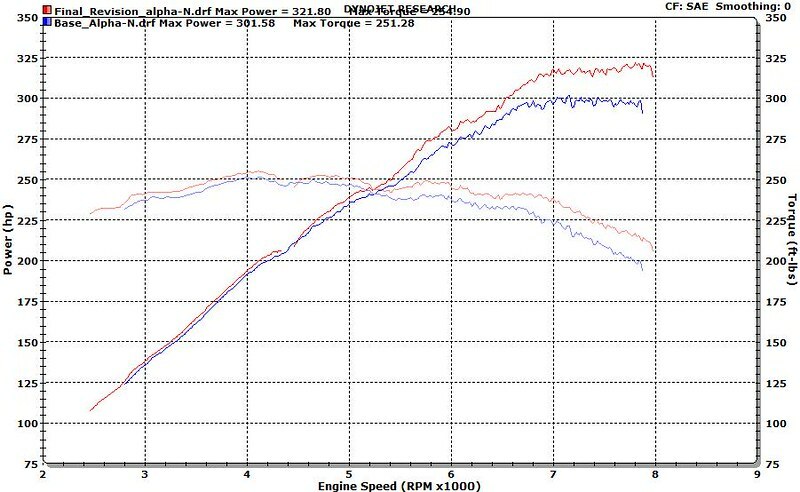 The separation between power curves above 4500 rpm is awesome. You can definitely see the knock sensors working it out, judging by the 'saw-teeth' in the upper RPM areas. Congrats on the numbers, and if you haven't already, please also try to post up in flipm3's 'Official Dyno Thread' as well...if you get a chance. 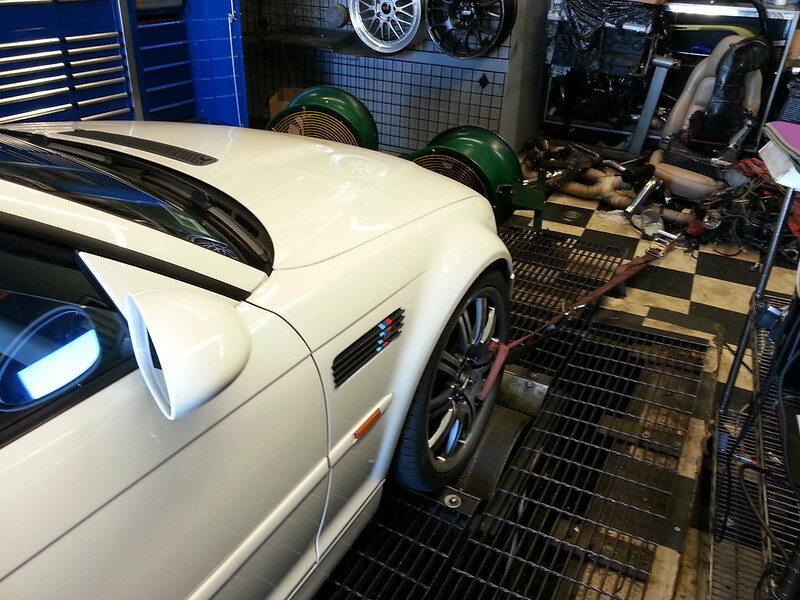 I've heard of RK Tuning, although not super familiar w/them, but Jordan's tune certainly seems to be doing it's job! Did you happen to get any AFR, timing, or IAT numbers??? Again, just goes to show & contrary to what the popular consensus was even just a couple of yrs. ago, they're definitely gains to be had w/a custom tune vs. a 'canned' tune. EDIT: Also curious as to why you went Alpha-N??? Are you contemplating going to an aftermarket airbox sometime soon??? 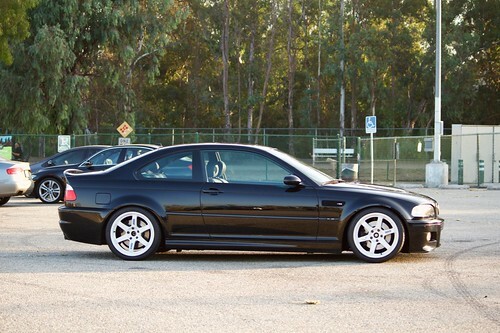 IMO, I would rock a MAF system all day long vs. Alpha-N...if I wasn't running a CSL type airbox or going FI. Last edited by stash1; Mon, Apr-08-2013 at 02:29:27 PM.